Speaking to Bridget Milsom is like a burst of fresh mountain air on a sunny day: you’re instantly invigorated. Bridget is returning to Nepal three years after surviving a very serious climbing accident in the Himalayas near Kathmandu in October 2011. Nothing stops this extreme adventure traveller—despite her accident she’s still climbing mountains all over the world! 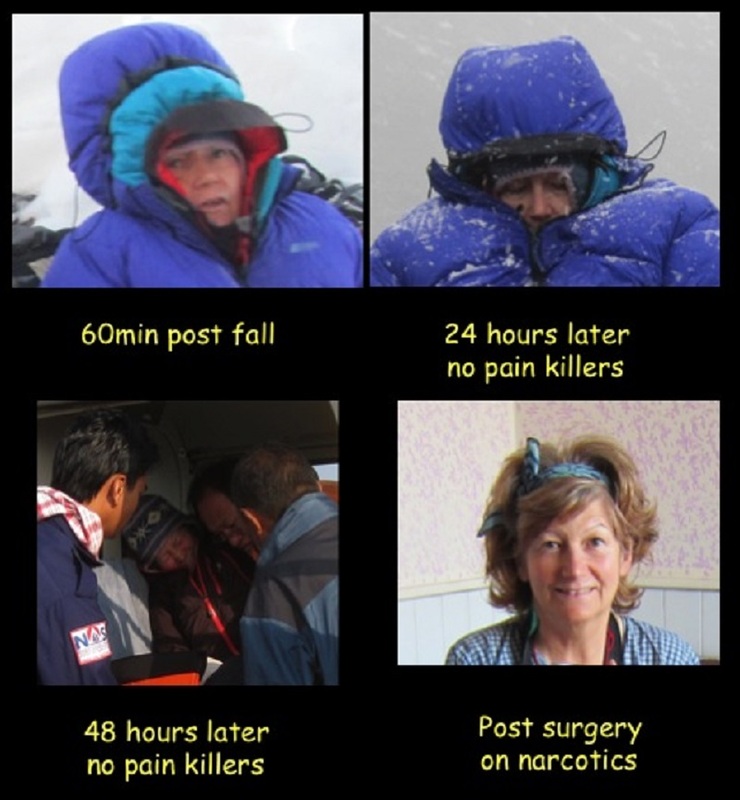 Here’s her inspiring story and pearls of wisdom for any traveller injured abroad. Bridget and husband Bill on Pachermo Summit, Himalayas, Nepal. The following account is based on my recent conversations with Bridget and a letter sent by Bridget’s husband, Bill, updating family and friends during the ordeal. 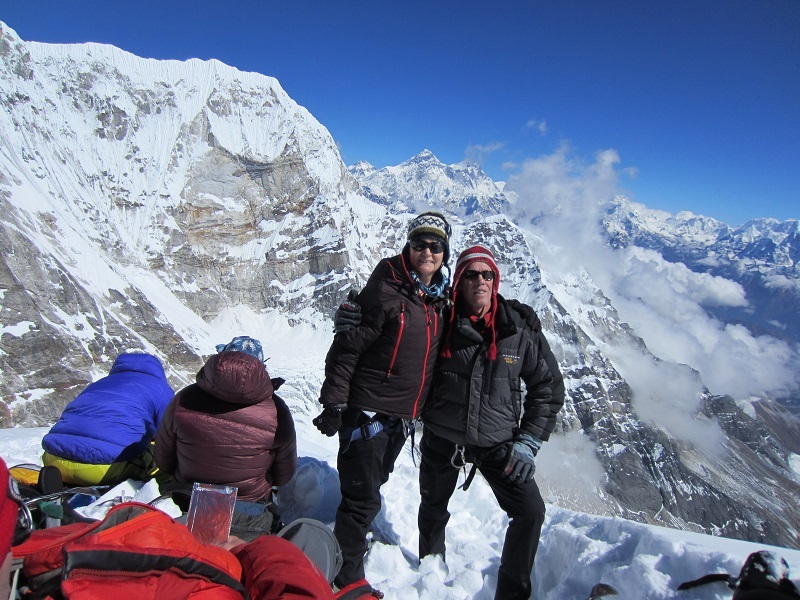 In October 2011, Bridget and her husband, Bill, participated in an expedition in Nepal. Their goal: summit Parchermo, a 6,200 metre peak. They spent some time trekking in Nepal’s Rolwaling and acclimatizing in preparation to cross the famous Tashi Lapsta Pass. 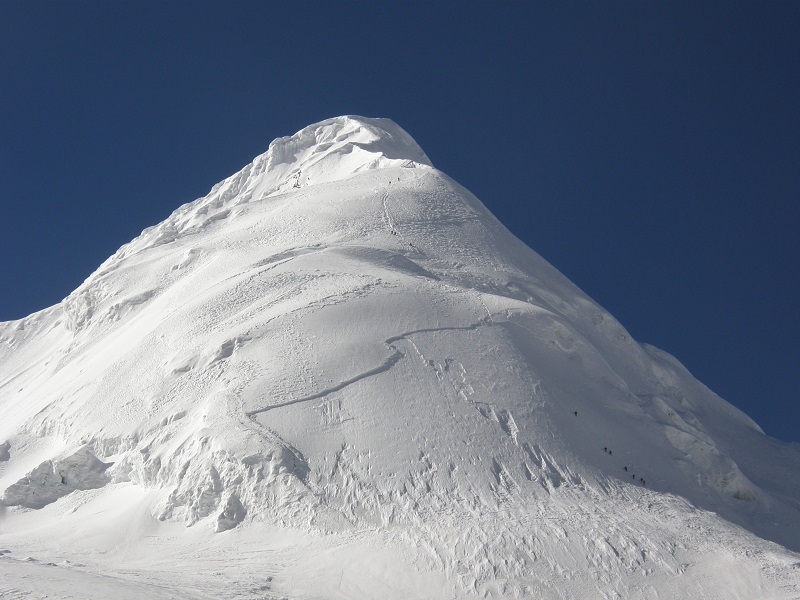 The morning of Oct. 25, they successfully ascended Pachermo’s summit. Those tiny dots on the right are the brave ones summiting Pachermo. Rolwaling and Khumbu regions of the Nepal Himalayas. Bridget’s accident happened during the descent. The group was almost down to the pass, but the last bit was a steep 45 degree slope of frozen snow. Four team members had already descended on two fixed ropes in a pseudo-rappel, but as Bridget started down, the anchor pulled out and she fell backwards, tumbling 50 metres. Her crampon caught, but her body continued to fall, causing her right ankle to fracture and dislocate, and her right wrist to fracture as well. Being an experienced mountain climber, Bridget attempted to arrest herself and slid to a halt at the bottom of the slope. The traverse to High Camp, and the descent route from the Pachermo Summit. It took the team almost six hours to get Bridget off the mountain—initially using her backpack as a sled, and later, a sleeping bag. They made it down to High Camp where a Dutch couple sheltered her in their tent for the night. 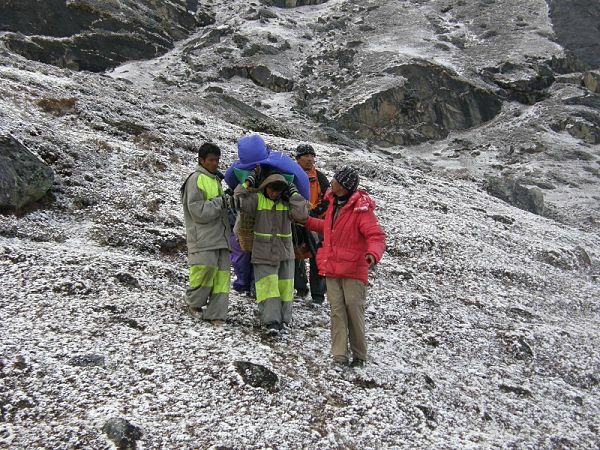 The Sirdar (the local leader of the Sherpas and porters), made a dash for the lower camp. It looked like all five climbers would have to spend the night hiding from the elements along with the Dutch couple in their two person tent. Thankfully the Sirdar reached the next camp in time to send porters with tents, gear and food back up the mountain. He also organized a helicopter rescue using the team’s satellite-phone. Early the next morning, the porters transported Bridget in a basket on their backs. They traversed the cliff bands and descended a steep snow gulley to a flat spot to establish a landing zone for the helicopter. There was significant cloud movement in the valley that day, shifting winds and new snow. The helicopter pilot was not comfortable with the pick-up spot, circling the site several times but unable to land. 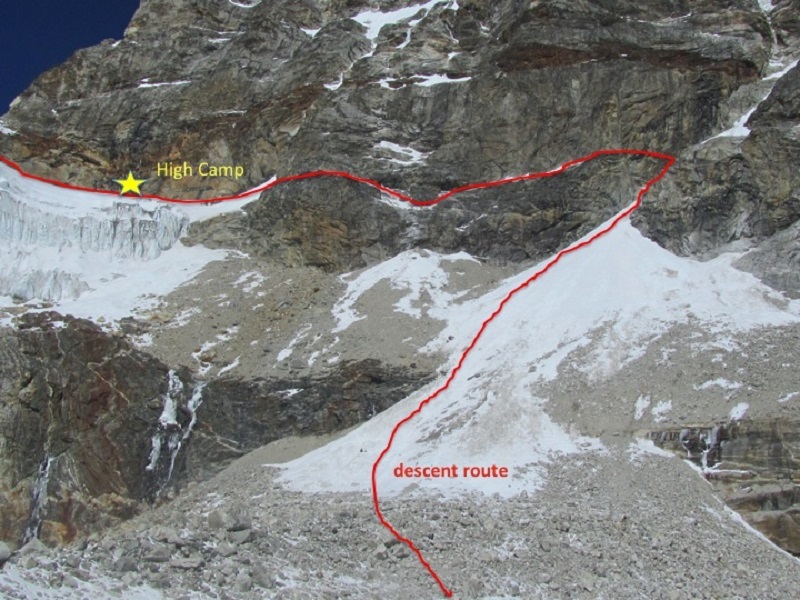 As a result, the team spent 11 hours carrying Bridget down to base camp at lower altitude where they finally got a helicopter rescue on the third day. 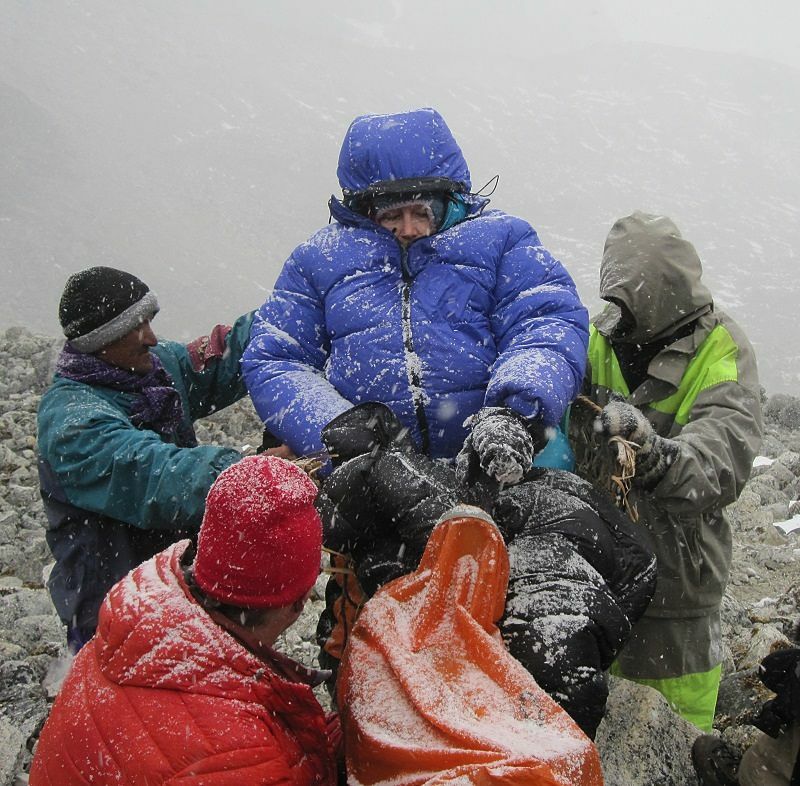 Sherpas carrying Bridget down the mountain. Bridget arrived at the Kathmandu airport at 9 am October 27, and was rushed to B&B Hospital in Gwarko, Lalitpur. She went in for X-rays and was in surgery by 11:30. Bill remembers: “the quality of the work was superb and the patient care at the hospital was fantastic”. As soon as they arrived at the hospital, Bill called our claims line, Claims at TuGo. He briefed us on what happened, gave us the contact information for the hospital and helicopter company, and provided the details for us to provide immediate assistance and get started on her claim. Bridget remembers “the claims department was super re-assureing”. Bill did a great job keeping our assistance and claims department up-to-date on Bridget’s condition, pre and post-surgery and let us know what the surgeons and doctors wanted to ensure Bridget’s travel home. 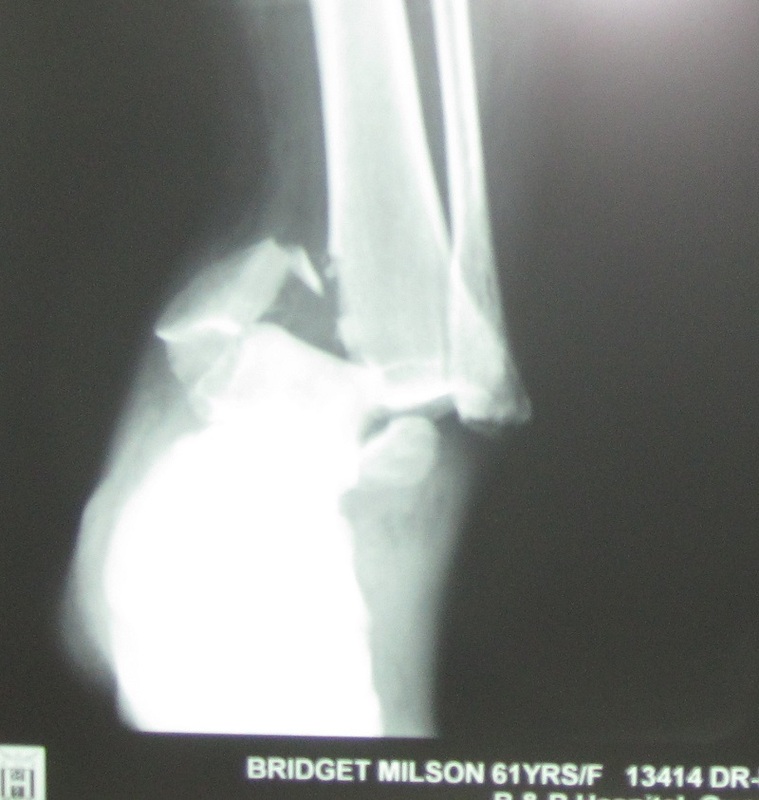 Bridget’s x-ray shows how bad she fractured and dislocated her leg in the fall. Bridget arrived back in Vancouver on November 3. She was immediately admitted to Lion’s Gate Hospital where she spent the next four days getting follow-up care. She had wisely kept her boot on during the rescue, preventing the dislocation from turning into a compound fracture. The tension on the lateral side due to the 48 hours of swelling did however split the skin, causing some drainage and necrosis. Bridget never lost consciousness during the fall and was totally involved in her own rescue organizing and directing events (“it’s Bridget after all,” laughs Bill). She was upbeat and positive throughout, despite a lack of any serious pain medication and the two days of constant jostling. Accidents happen. If you’re in a remote location, be prepared to get yourself out to the nearest access point. “Our outfitter, Maila Temba Sherpa, and his family did an incredible job organizing the rescue”. Claims at TuGo covered the cost of the air evacuation and ambulance ride to the hospital. If you’re in an accident, communicate with your insurer right away. Give them details such as the time, date and nature of the injury, the name and contact information of your outfitter or helicopter evacuation service, any estimated recovery time, and the date of your flight home. This will help them gather information and help get you home. Bridget packs a punch in our community. 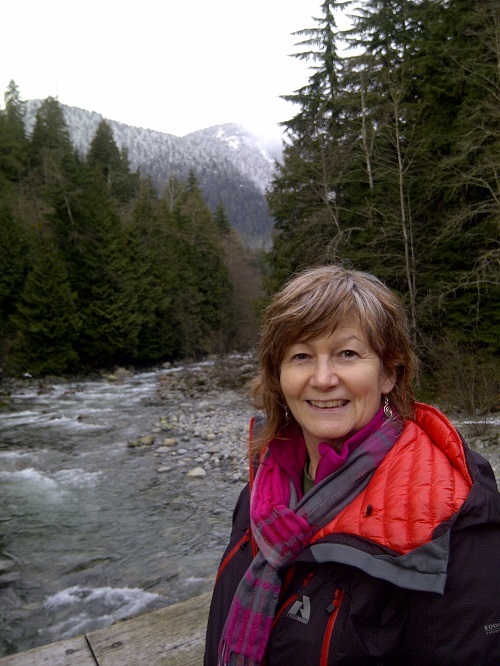 A member of the Alpine Club of Canada since 1978, Bridget has served on Vancouver’s First Aid Ski Patrol since 1985, and joined the North Shore Search and Rescue in 1996, where she served as Training Officer for four years and Team Leader for another four. She has been an Officer in the Order of St. John Ambulance since 1994, having been a first aid instructor with the organization since 1970. As a leader in public safety in wilderness and urban settings, with expertise in search and rescue, first aid training, and emergency planning, it’s obvious she’s an experienced trekker, and that accidents can happen to anyone! Bridget continues to foster relations between volunteer rescue teams and emergency services, and contributes actively to mountain education and awareness in her community. And she’s still climbing mountains all over the world. Bridget, recovering from the accident, but hiking Lynn Headwaters on crutches! North Vancouver January, 2012. On October 16, 2014, Bridget returned to Nepal. She’s taking TuGo’s insurance with her, just like she does on every trip. Bridget’s story is not only inspiring, it’s a great lesson for any traveller injured on a trip, be it in a mountaineering accident in Nepal, or an unexpected accident on a sunny beach. Share this story with your friends and family, and take these tips with you on your next trip.